Pour vegetable oil about 2 inches deep into deep skillet. Heat oil to approximately 325 degrees. In a medium bowl, stir cornmeal mix, flour, sugar, and salt together. Set aside. In a small bowl, beat eggs slightly and then stir in the milk. Add the milk mixture to the cornmeal mixture, stirring well. Add the melted butter and thawed corn. Drop by tablespoons into the hot oil. Cook 2 to 4 minutes on each side, or until golden brown. Remove fritters from oil and place on paper towels to drain. 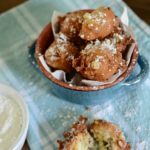 When fritters have cooled slightly, roll in powdered sugar and serve immediately.